Many countries in the Middle East and North Africa suffer from water shortage. This partly contributes to the production of concentrated wastewater with COD values higher than 1500 mg/l. Treatment of such concentrated sewage using conventional aerobic treatment options like activated sludge systems will result in the production of considerable amounts of sludge that could be most problematic with respect to handling and final disposal. Conventional aerobic wastewater treatment of such sewage requires high energy demand for aeration and exhibits high operation and maintenance costs. 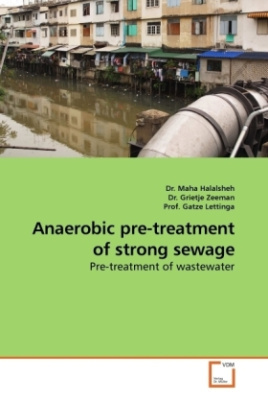 Anaerobic pretreatment of such sewage may present an attractive option in order to reduce sludge production and minimize associated operation and maintenance costs. This book focuses on pretreatment of wastewater produced in Jordan with a special interest in the Up flow Anaerobic Sludge Blanket (UASB) reactor and some of its modifications. It presents the results of several investigations performed to show the feasibility of applying such a system for treatment of concentrated sewage at fluctuation temperature conditions. The book was first submitted as PhD thesis at Wageningen University.